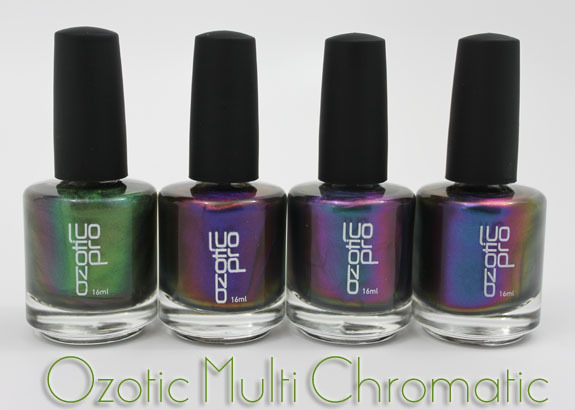 Ozotic Pro Multi Chromatic Nail Polishes are made in Australia and a brand I never thought I would get my hands on. But I did, and boy did I ever pay the price…shipping that is. Multi Chromatics come (or came) in six colors including 502 (Sands), 503 (Rainforest-I think now discontinued), 504 (Twilight), 505 (Eclipse), 506 (Reef) & 520 (Molten). These are nail polishes with not just a duo-chome effect but multi-chrome effect, so you see many different colors running through it as you turn your hand and change lighting. The ones I have are 503, 504, 505 & 506. Now 504, 505 & 506 almost look exactly the same in the bottles, depending on the way you look at them. But change the direction and you can see the differences. If you look at the bottles from above, you can now see the differences between 504, 505 & 506 easier. On their own, these are very thin sheer colors and don’t look like much. The magic happens when you layer them over another color. THEN all the multi-chromatic goodness comes out! I layered all of these over a black creme so you can see the differences and how amazing they are. Each of these is one thick coat of black then two coats of color. As you can see 503 looks very different depending on the way you move. In the bottle it definitely looks green, but you also see a lot of brown/red/copper coming through. It changes from an olive green, to vivid green to brown, to copper/red, etc. It’s just amazing and sadly, I think now discontinued! 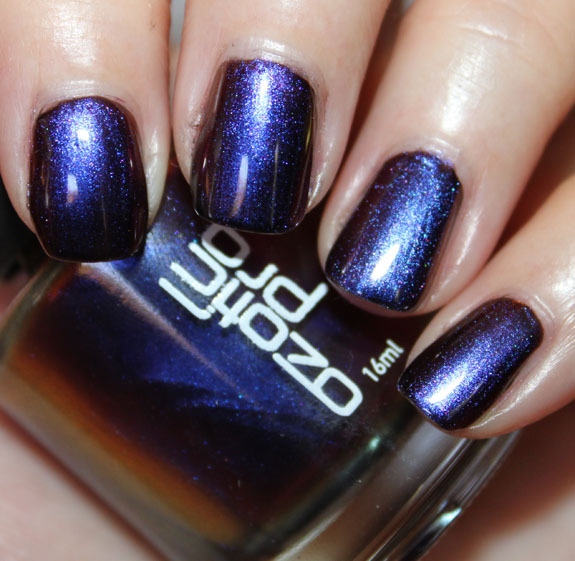 504 is a very deep royal purple that changes to deep blue when you move around. Now over a black, I didn’t notice as much of a multi-chromatic effect with this one. Not sure if it would be more apparent over a purple or blue base or not. Either way it’s definitely not just a straight purple. It’s very vivid and has a great blackened edge. 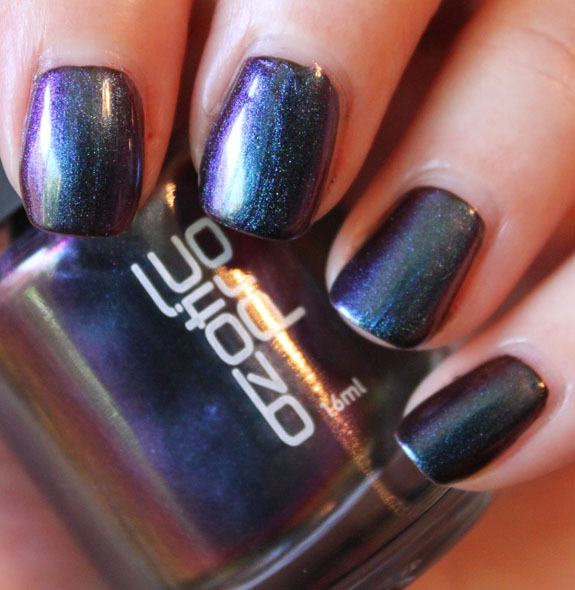 505 looks like a deep purple/blue in the bottle and changes from a deep green to a dark purple to blue. So pretty! 506 also looks like a purple/blue in the bottle. 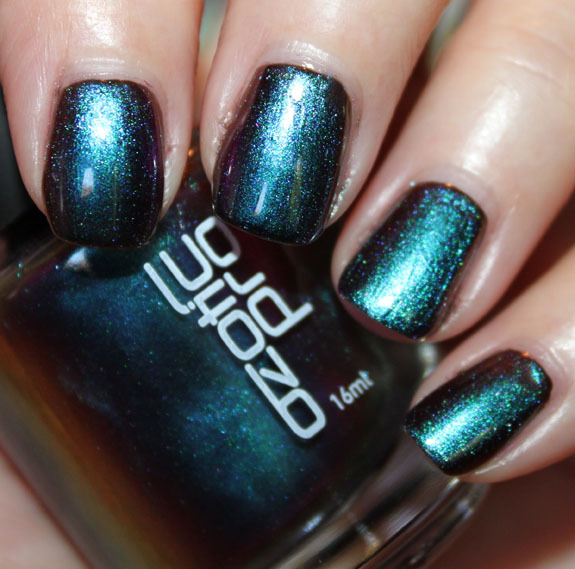 When you put it on it turns into this amazing deep ocean blue and changes to greenish blue and then royal purple. I think this one is my favorite one of them all. 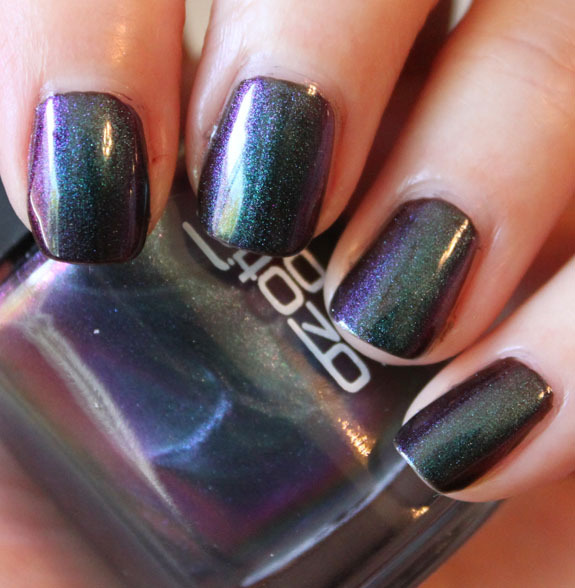 These are so great, especially if you love a multi-chrome effect. You definitely have to layer them over a base color to really get any use out of them, but since you only need two coats, that works fine with me. I love that not only are they multi-chromatic, but they are super shimmery as well. Gorgeous! Availability: Therein lies the rub. I got these at Picture Polish online which is in Australia. They are easy to order if you live outside Australia, but NOT inexpensive!!!! The shipping was completely outlandish and actually wound up being twice what I thought it would be. So if you have an Aussie connection, I would try getting them that way instead! What do we think about these multi-chromatics? 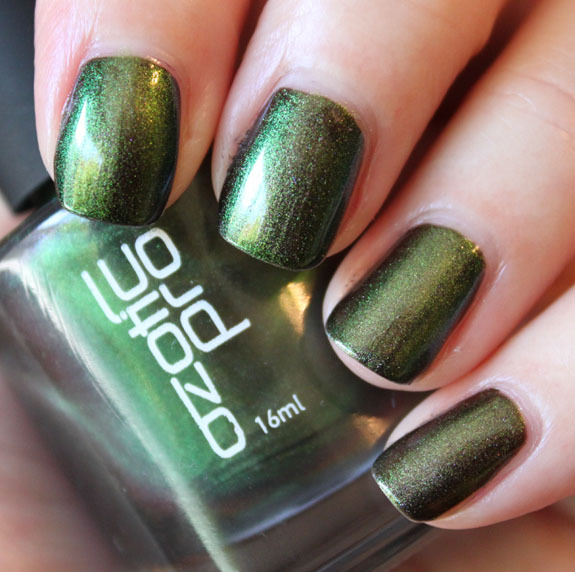 Have you tried Ozotic yet? These are all so beautiful and I want to get my hands on them eventually when my budget is looking better. Multichromes are some of my favourite polishes to wear. More companies should make them! It’s too bad that they burned you with the shipping. Hate when that happens. 505 is very pretty. Incredible shift. I’ve been looking at these and some others from their line, but the shipping charges….YIKES!! That’s enough to scare me away for good! Your swatches are so amazing though and the shades to unique…I’ll just have to enjoy them on you, I guess!! I love rainforest. Thanks for sharing! Picture Polish just announced a discounted international shipping deal – it’s still expensive, but for me, it was worth it. So pretty! I ordered from here but I was scrutinizing which color to get from each line and now I think I picked the wrong one of these! I did figure all the costs and use the currency converter before ordering & I thought it wouldn’t really be any cheaper to ship to my friend in Oz & have her ship to me, when I ship there it’s outrageously expensive! I got an email from them in the last week saying international shipping has been reduced actually but I didn’t check to see to what! Great timing for this post! 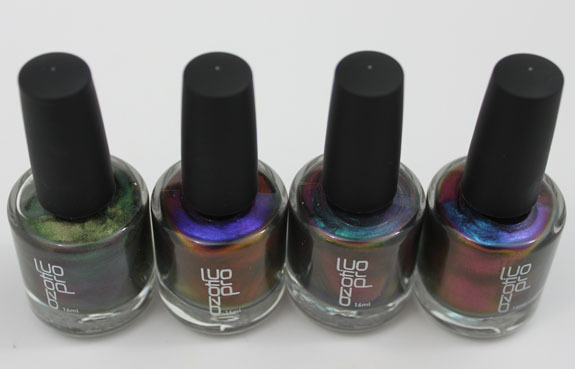 I saw the international shipping deal from Picture Polish and was doing some research for swatch comparisons of their multichromes. Now I’m deciding between getting 2 multichromes or 505 + Elytra 529. I got all the Elytra’s also, they are AMAZING!!!!!! Oh noes!!! What to do? What to do? Ohhhh, these are so gorgeous. I’ve checked them out and they’re not for me atm, but are definitely in my future, esp Eclipse. 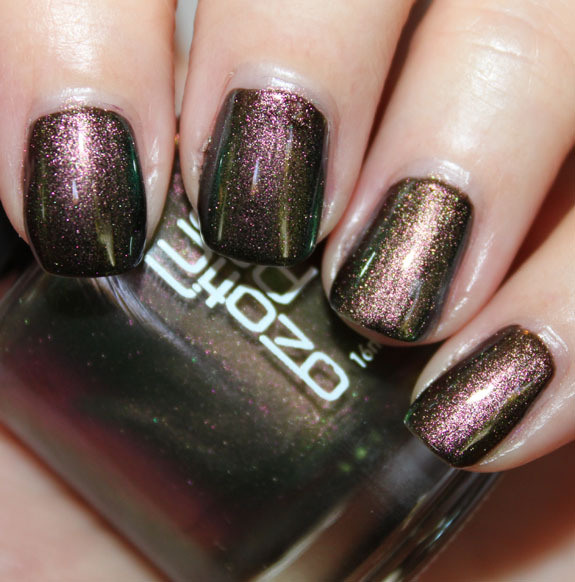 I’m with Mary – more companies should make muti chromes, and more flakies, too. Why don’t they? Drat! Why did they get rid of 503 (rainforest)? SSSoooooo preeeettttty. But they are all completely magnificent- I’m checking out what that international shipping discount is all about, asap! I so wish these were easier to get because I am LOVING eclipse! Such amazing unique shades! Great review. These all look great on you! I can’t wait to get mine…stupid Canada Post strike!! Geez, some North American nail company could make a killing on dupes here. In the meantime, I’ll just have to be a sore loser. So freakin’ jealous. Gorgeous swatches! I have Eclipse (I live in Australia so it was fairly easy for me to get) and I absolutely love it. I also get the Picture Polish emails so I thought you’d all be happy to know that they’ve apparently dropped their international shipping prices. So nuts, ladies! 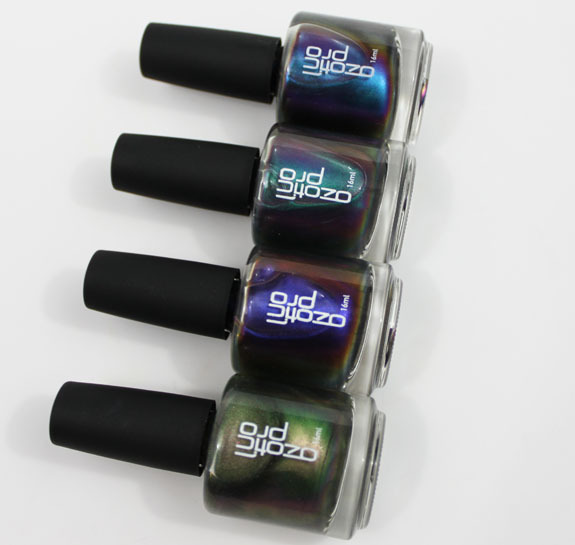 The Ozotic brand has multichromatic glitter polishes, too. I have one of these, but haven’t worn it yet. It’s the same deaL: layer over black to get the most awesomeness. I have 505 and also an elytra – can’t remember which number off the top of my head – but shifts blue/purple. Totally worth the shipping cost for the 505 alone as far as I’m concerned – can’t stop staring at my nails when I have it on! I’d love to have these but the shipping price, forget it! They are beautiful. They reduced the shipping, but increased the bottle price to 14.95, they look amazing though….uugh really want them all!! Will you be posting swatches of the Elytra’s as well? I’m dying to see them!